The trend toward urban living in America is one that is continuing to fundamentally impact our cities. Perhaps the area where there has been the most change in the last ten years is in urban mobility. With transit improvements, young people especially have begun to move away from single occupancy cars to get around, seeking other mobility options. Los Angeles, has made tremendous strides both in terms of its rail and bus network. Still, it’s a long way from a City like New York where a transit stop is always nearby for easy access. If you are a transit user, you will have the challenge of that last leg of the journey. If you have means you can take a taxi or rideshare, but that gets expensive. And of course there is the additional time it takes to get from origin to destination. One of the areas of most significant commercial innovation is in the transportation space called “micro mobility”. Loosely defined, micro mobility consists of the ways in which we get around in the ‘first and last mile’ of trips. The concept began with public transit agencies like Metro and cities like Santa Monica who took it upon themselves to provide bike share programs adjacent to transit stations. Bike share systems such as Santa Monica’s Breeze system and that used by Metro are effective micro mobility networks; both have enjoyed significant growth in popularity since inception. A City official informed me that the City has increased ridership by roughly 10% year over year. The Metro system relies on docks to return the bikes after the ride, but often the docks are not convenient for point to point trips. An interesting innovation is the Santa Monica Breeze System’s “dockless” option in that you can rent the bike and return it to a docking station or simply park it where you finished your ride. The City will charge you two dollars for the convenience, but their network can accommodate the various needs of an array of users. The dockless concept addresses one key challenge of micro mobility – the ever-present need for flexibility. In cities such as Washington DC and Seattle, there have been pilot programs for dockless bikes that have been popular. In September 2017, two wheeled ‘rides’ were introduced into the marketplace (the company prefers them to be called ‘rides’ and not ‘scooters’ in an effort to disassociate the apparatus from a kids’ toy) built by the company Bird Rides, Inc. The company is based in Santa Monica, CA and was started by a former UBER employee Travis VanderZanden. It’s an app-based mobility network of scooters that you can unlock with a QR code. They are “dockless”, meaning they can be left anywhere when you are done riding them. They charge a dollar for each ride plus 15 cents per minute. 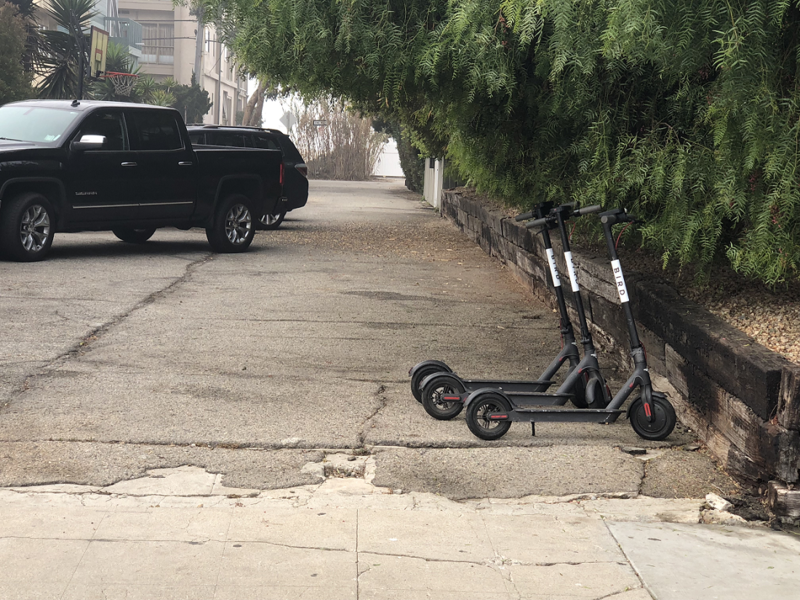 With the demographic mix of techies and tourists of Silicon Beach, Bird Rides has been an instant success from a business perspective. The rides are being used constantly throughout the day and into the night, and with the traffic and parking issues of the beach, they offer a relatively low cost, extremely nimble and fun way to get around when travelling a few miles. Bird Rides also offers local entrepreneurs a way to make money in servicing the rides, offering $5 per charge for up to 20 Birds / $100 a night. In San Francisco, a startup mobility company called Popwheel is getting ready to launch this May. The technology is more similar to a segway, where you balance on a two wheel mobility platform that is activated by internal gyroscopes measuring and reacting to your subtle movements leaning forward, backward, left and right. Despite the challenges of this technology as opposed to the simplicity of Bird Rides, the founders similarly saw a niche they could exploit in the mobility space; that is, tech workers within urban centers who commute only a few miles. For example, Airbnb gives each employee a $700 UBER credit for mobility. Popwheel is targeting corporate users, offering $50 monthly memberships with unlimited rides, which includes insurance. Their docking stations are on the backs of cars, which gets around the need to get approvals or build docks in the public right of way. Another interesting feature is the “follow me” mode. After you load up the Segway (they can easily handle up to 200 lbs. ), you take the remote control, put it in your pocket, and the segway follows you around. The Popwheel folks hope you will take one to the grocery store and have it follow you with your groceries on your run home. 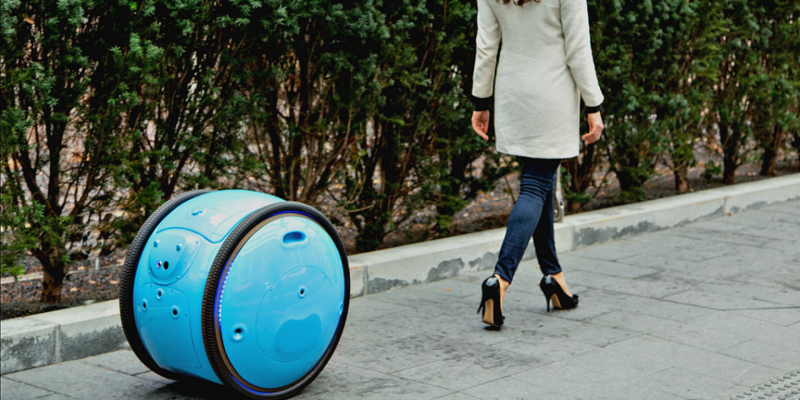 Regarding contraptions that simply carry stuff, at the Consumer Electronics Show (CES) Convention in Las Vegas, Segway introduced the Loomo Go, another robot which can carry things for you. And the Piaggio Gita is another version of this technology which appears to be sidewalk-ready. Experts including Santa Monica’s Mobility Manager Francie Stefan believe that the transportation ecosystem should now be thought of in terms of diversity like a biological ecosystem; and that over-reliance on cars is like over-planting a single species of plant. 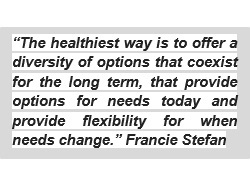 “The healthiest way is to offer a diversity of options that coexist for the long term, that provide options for needs today and provide flexibility for when needs change,” she notes. A 2016 study showed 53 percent of trips by residents were less than 3 miles, and 18 percent were less than one mile. While walking is a great option for the shortest trips, there are myriad other kinds of trips that can utilize a short-range vehicle. But Are We Ready for This? So much of our current dialogue regarding mobility in cities is being taken up with how to accommodate autonomous vehicles as replacements to cars, but as Ben and I talked we started to consider the profound impact of micro mobility technology on the use of all of our public streets and sidewalks, transit systems, airports, and most other public places. Not enough thinking has been done about this fast-approaching reality. I pored over the newest National Association of City Transportation Officials (NACTO) Standards for Autonomy and found little to nothing about any of these new technologies being accommodated in street design. 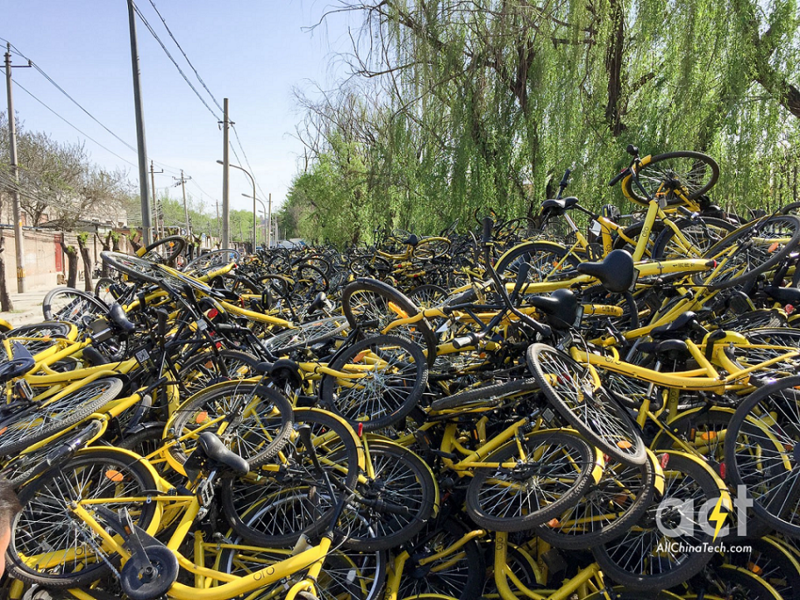 The image above is from Shanghai last year, where numerous bike share companies competed so fiercely for business it created a massive oversupply and the resulting dumping by the side of the road. Its wasteful and ultimately, a human safety issue. Secure proper City business licenses and work with the City’s Business License Division to ensure compliance with local business licensing regulations. Pay previously issued Administrative Citation fines totaling $6,115.63. Pay additional fines and investigative costs totaling $300,000. Run a weeklong public safety education campaign on the Big Blue Bus. Accept responsibility for Bird’s prior conduct, plead “No Contest” to an infraction and pay additional criminal fines of $200 plus statutory penalty assessments. Allow usage only along designated routes (perhaps in designated lanes w bikes) provide publicly accessible docking areas. Require an autonomous feature or commit to a signaling system that moves rides to neutral locations after completed use if not docked correctly. Reward “good” behaviors with incentives such as discounted rates, penalize “bad” behaviors with fines or ceasing of operations. Micro mobility systems are a great way to address the changing needs of society and clearly the public is eager to use them. If our goal as a society is to reduce emissions, encourage transit usage, and support more healthy lifestyles we must find a way to accommodate innovations in mobility while retaining the public trust in keeping our streets reasonably safe and obstruction-free. It appears that we are at a tipping point in terms of how well we can accommodate micro mobility options within our current configuration of streets and sidewalks. It’s only going to get worse if left unaddressed. Who ultimately decides how we should parcel out the public right of way? It should be a collaboration between government, the private sector, and the community at large. Let’s hope we can work together to solve such intertwined issues quickly and effectively!